Wine tasting weekend is just a fancy way of saying I’m getting wasted this weekend. I like it. 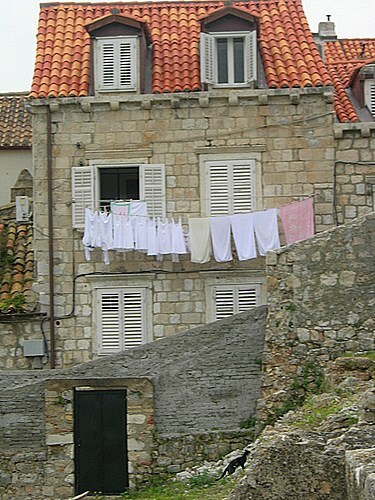 I’m off to Istria with the Brava Wine Company, run by the lovely April. She’s a smart cookie; she has made drinking wine a career. I’m paying attention. Istria is gorgeous. All the delicious wine they make here is just the boozy icing on the cake. 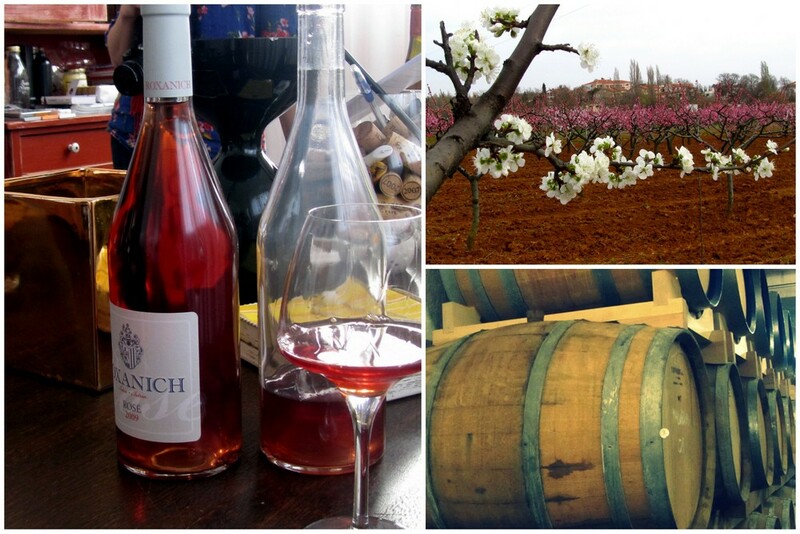 Making good wine is about a combination of things – passion, dedicated effort, luck, weather. Drinking good wine is just about common sense. At some point it comes down to taking notes or drinking more wine; more wine always wins. Each time I pour out the wine, my glass is full again. This is by far my most favourite magic trick. Mixing wines is actually a fantastic idea. Wine tasting = no hangover. Eureka! When you come back with more alcohol than clothes in your bag, you know you’ve done something right. Rome is still asleep. The morning air smells different, untainted as yet by pizza and tourists. A few workmen amble along the fountain, sharing a cigarette and a joke. Their laughter bounces against the old discolored stones before fading away. In the background Neptune stands tall, his muscles perfect, held in tension and plaster. His entourage hangs around him, playing it up in the fresh morning light. I follow their every curve, dent and detail in quick greedy movements. In an hour everything will change: floating sunflowers, umbrellas and backpacks will flood these streets. Tacky souvenirs will push the fountain in a corner. Vendors will set up their knock offs under the eye of a concerned Madonna. 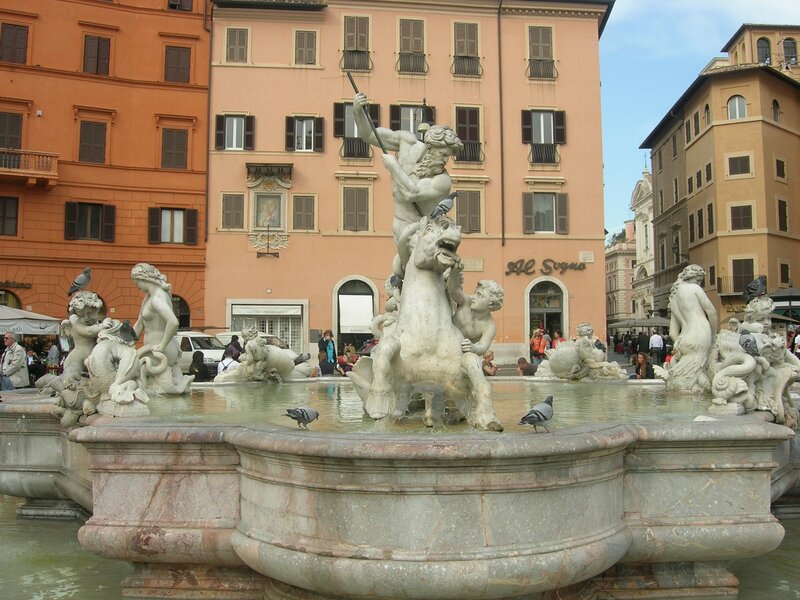 Somewhere in the crowd a wallet will be misplaced; and Rome will be lost in a swirl of clichés. It must take him hours to get ready for work. I imagine myself in his shoes: first some protective ointment – a lotion or skin cream, followed by the costume, a metallic skirt, the false chest and boots. Then the layers of paint; the green is the colour of evil intentions, but it’s the yellow and black that brings this character to life. The look is completed with a circular shield and the green-gold helmet. He works in a competitive field. He has to outshine the Star Wars characters, the Marvel comic heroes and villain and a host of magical beings. It means he has to get to the square in good time no matter what the weather. It’s the only way to find the right spot, one that enjoys the best tourist foot-falls, and set up. He also needs to have his papers in order. More than once the cops come rolling by, on their government issued cycles, and demand to see paperwork. If they are satisfied they roll on. If they aren’t, they shut the act down. He is an artist, but also a businessman. His work –hours and hours of posing – can be enjoyed for a price. 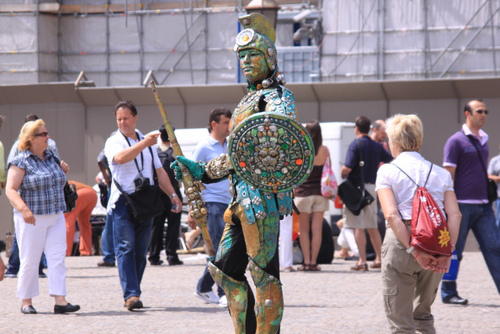 For the camera-wielding tourists who want his picture but don’t want to part with their coins, he lifts his shield and covers his elaborate make-up in one practiced swoop, blocking the shot. If you drop the coin in his hat, he poses, playing it up for all your money’s worth. He stands, usually pretty still, for hours during the day. But every now and then you realize he is just another bloke trying to make a living. I’m lucky to be around for one such moment. When a cluster of kids leave, waving lingering goodbyes, he puts down the shield and pulls off his helmet. He reaches into his black trunk for a juice box and what looks like a sandwich. He takes a bite and a sip, and then he turns to Darth Vader, who stands a few steps behind, and makes a comment. They both laugh. They laugh for a while. I sit against a Tibetan prayer flag. Its red and yellow embroidery runs the length of the wall. I’m surrounded by vibrant Tibetan mythology – there are dragons, demons, flowers, and so much more that I don’t follow. 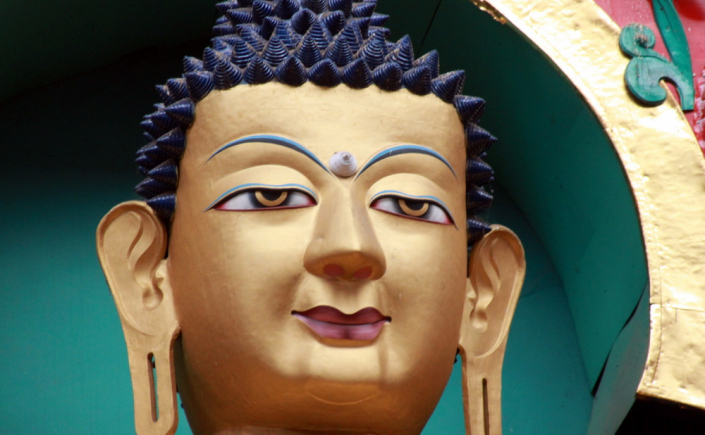 From across the room, the Buddha smiles; his face is serene; those beautiful hand-painted eyes are a universe of calm. Kushalnagar is an interesting mix of typical south Indian town and strong Tibetan influences. The golden pagoda of the monastery meets the heady aroma of Indian tea and the bright orange of the Buddhist robes blends in with the potpourri of local colours. Stuck in traffic, on the way to the monastery, I watch local traders interact with Buddhist monks on errands. There is an easy familiarity between the two, a relationship that has seeped into the social fabric, blurring the visible differences between them. The Bylakuppe Tibetan settlement, a set of camps, was established in 1960 in Southern Karnataka. It comprises of monasteries, nunneries, schools, and a number of Tibetan businesses. At the centre of the settlement is the Namdroling Monastery established by Pema Norbu Rinpoche. There are over 16000 Tibetan refugees living here. Many spend their lives dedicated to the study of Buddhism; others take to retail and hospitality, recreating a piece of their homeland, a home that most have never seen. The Namdroling Monastery is an extensive property. It includes gardens, dormitories, a bookstore, offices, classrooms, and a number of temples. Walking around the complex, taking in the main temple, the manicured lawns, the young monks going about their daily routines, the Buddhist chants and prayer bells in the background, is in itself an experience. Stepping into the main temple, past a beaded curtain, is like walking into a silent explosion of colour. The artistry, the designs, the grandeur, all make the room come to life. Dragons soar from my side and flowers burst into bloom. On the ceiling demons are slain and all around evil is beaten out by good. At the centre of the temple, on an elevated platform, three large gold plated statues rise above us all. The Buddha, his eyes serene, holds court with Guru Padmasambhava and Amitayush at his side. Soft prayers float through the room. You can’t help but close your eyes and meditate. The Namdroling Monastery follows the Nyingma tradition of Buddhism, and is considered to be one of the most prestigious centres of Buddhist learning. Young monks, the youngest seem to be around eight, receive a solid education here – they cover both traditional scripture as well as the modern syllabus. The monks display the duality of the world they live in – their traditional orange robes are matched by Puma sneakers. Their shaved heads are bent over shiny black cell phones. They inhabit the old world and the new, missing out on neither. The brown banana boat wobbled like a village drunk, swaying this way and that, as I tried to step in. The boatman, standing at the helm, one hand on his waist, the other on a long wooden pole, assured me there was nothing to worry about. His accent was thick, his English was broken. Unlike the resort staff, he was dressed informally, in a once-white tee shirt and a yellow-blue folded-up lungi. Once we’d settled down -the wooden seat was covered with a soft red cushioned, he swung into action. He had one foot on the quay and the other in the boat as he untied the rope tethering us to land. 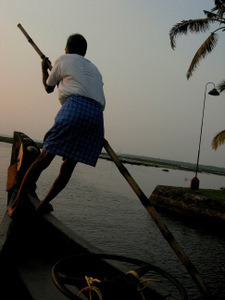 And then like an Olympic athlete, he swung the elongated wooden oar, lifting it across and above his body, and into the water, pushing the boat through an uncontrolled sprawl of water hyacinths, and into Kerala’s backwaters. Soon enough the lavish resort properties gave way to local villages. We sailed past temples and churches, shacks and villas, abandoned toys and drying laundry. Kids playing along the water waved at us and we waved back. Everything was dense and green and humid and muddy. The silence magnified every tiny sound. The water parting under the force of the oar; insect and bird sounds; the occasional clanging pots; a lone scooter puffing along the little road beyond the water. The boatman kept up a steady stream of commentary. That was where a famous actor was born. This was the village Arundhati Roy came from. That was a highly recommended local restaurant. This one was not. When we sailed past an under construction houseboat, he even explained the complex art of houseboat building. 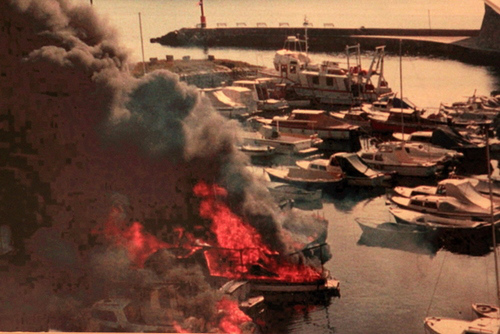 He also mentioned that the owner of said houseboat could well afford the costs involved (“He lives in the Gulf. Very, very rich man”), so there was no need for alarm. The boatman twisted the oar once again and willed the boat into a tiny stream. The muscles along his arm were well defined and belied his age. The glistening sweat spoke of the effort that was otherwise invisible. “This is my village,” he said as we passed another settlement, a mass of small homes hidden under thick green foliage, protecting the village from prying eyes. By the bank, not a few feet away from us, a middle aged woman, in a purple housecoat, crouched by the water. She was cleaning a pair of traditional Indian brass lamps in a forceful 1-2-3 scrubbing action. She looked up but for a second, giving the boatman a small nod. He returned her greeting and powered on. It’s pitch dark outside, even though it’s barely 3:30 in the afternoon. I am bitterly cold. My heavy scarf feels like an amateur in this Scandinavian winter. My ears are covered and my coat collar is stiff, pulled all the way up to keep the cold out. It doesn’t work. I feel the ice settle down in my chest, creeping through the gaps and falling in place with a painful thud. I’ve been walking around Stockholm’s old town, Gamla Stan, all day, conflicted: should I leave my hands stuffed in my coat pockets, or do I pull them out, along with my camera, to take pictures? To keep warm I walk into the stores that line the old quarters. I am not picky. When I feel my face is about to fall off, I walk into the nearest one. As a result, I’ve spent a fair bit of today with reindeer and moose masquerading as kitchen towels, fridge magnets and candle stands, and the Swedish Royal family, smiling from cups, caps and cards. What I’d really like to do is step into one of the cosy candle-lit restaurants serving lunch. The candles stand right by the window, the flames are sturdy, strong, tempting the cold to come in and try something warm. But I’ve never learned how to squeeze in a second lunch, so I settle for a compromise. I go for fika. Fika, as I gather, is a sort of Swedish mix between high tea and coffee break. It involves something warm in a mug and something sweet on a plate. And given the weather, they are both had in a warm, comfy place. So I fika. I fika, I take a photo, I look at plastic moose. I fika, I take a photo, I look at reindeer hangers. I try the tea in a kitschy cafe, with a cinnamon bun, a Kanelbulle – I think it’s called. In an airy cottage-type cafe, I opt for black coffee with a gigantic fruit studded muffin. In the third, I sit on a bench with a pastry and a glass of water. 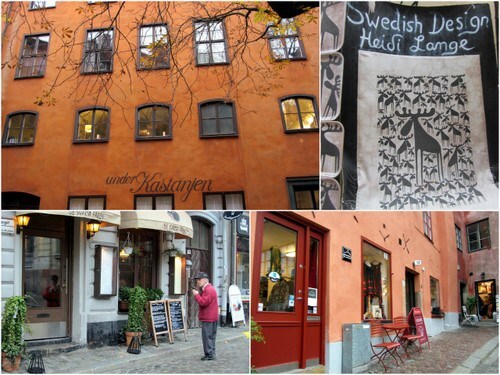 In each, I open my guidebook, and plot tomorrow in Stockholm. Outside the walls there’s a whole other world. Two actually. On one side is the city, the rest of the city, where regular people lead regular lives, go to work, go to school, fuel up their tanks, and clean their floors. On the other, is the sea, the Adriatic and everything it brings with it. This is an anomaly in Croatia. The sea usually doesn’t play second fiddle to anything. The electric blue-green water, so clean that you can see the floor down below, past the fish and other sea creatures, takes it well though. It entertains those who’ve had their share of the city within the walls without sulking. Sometimes it’s a giggling group with a hyperactive camera, at others the solo traveller with a paperback, or an exhausted local grabbing a bite (and some peace) on a bench. It’s never too lonely though, not with the daily ferries, charters and fishing boats. When the people turn away, it entertains cats and spiders and sea creatures like crabs before they are caught and added to the pot. When it’s left alone, as it usually is at some point, it sings and hums, sometimes softly, at others it’s a roar. The war is over, but it isn’t forgotten. Entering the old city from the Pile Gate, visitors pass the map detailing war damage. In the Franciscan monastery, exhibits share space with bullet holes and lodged shrapnel. The Sponza Palace has a war time photo exhibit, a memorial and a reminder of the brutalities of a war fought not too long ago. Walking past photos of burning landmarks, the very landmarks I’ve spent the morning with, is eerie. I try to fight that dark, clamping heaviness as I walk past the soldier portraits. Some are just fresh faced boys of no more than nineteen. No one should have to be nineteen forever. They serve the sea on a platter, in glass bowls, on pizza, between bread. They serve it along the waterfront, in tiny lanes and along the steps. The catch, it goes without saying, is fresh, caught between the dark night and dawn; maybe this explains the lurking cats around the town. The ‘but’ comes before and after the meal. It starts with over eager waiters accosting passing visitors, waving menus, almost forcing them in, promising the best authentic Dalmatian meal. The trite posters along the wall may tell a different story. Even when the food is great, and the service not so bad, the bruise comes with the hefty bill. 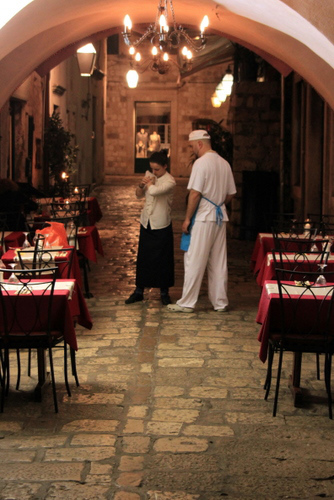 What goes by as a meal in Dubrovnik could get you three elsewhere in the country. The one good thing is that you’re never in the mood for seconds; you don’t (further) overspend; you don’t (really) get fat. I have the city to one side and the sea on another, but my eyes are locked on to this window. 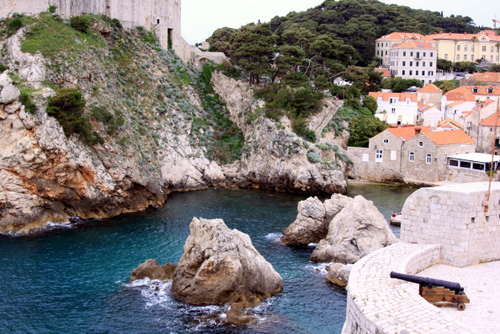 It opens out to the walkway on the wall, unwittingly inviting a stream of tourists in. I can’t imagine living with this kind of pressure, let alone drying out my laundry for the world to see. Three rope strings hold half a wardrobe, white sheets and vests hide the intimates ever so slightly. Multicoloured clips stand in a crooked line, their uneven teeth clamped tightly over the cloth. When the sea pushes a slight breeze inwards, the line sways and so do the clean clothes. Maybe it’s just in my head but I catch a whiff of aromatic detergent. A butterfly of guilt flits about but I can’t move away before taking a picture. A few feet below me a black cat scurries over sprigs of lavender and past ancient stones, the very things that make this city special, and yet it is this seemingly mundane shot that I can’t tear away from.